Basil Seggos is commissioner of the New York State Department of Environmental Conservation (NYSDEC). 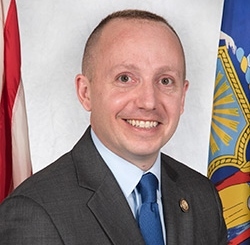 Previously, he served as deputy secretary for the environment and, before that, assistant secretary for the environment to Governor Andrew Cuomo. Prior to working in the Governor’s office, Seggos served as vice president of business development at the clean-tech private equity company Hugo Neu Corporation, chief investigator and attorney at Riverkeeper, associate at the Natural Resources Defense Council, and as a legal clerk at the White House. He is a graduate of Pace Law School and a captain in the U.S. Army Reserve, Judge Advocate General’s Corps. After serving for many years in various capacities in NYSDEC’s Division of Environmental Remediation and Division of Water, Mark Klotz is currently the Division of Water’s director, with responsibility for statewide water project management and policy development. Klotz is also a governor’s representative on the Delaware River Basin Commission and the Great Lakes-St. Lawrence River Basin Water Resources Compact Council, the commissioner’s representative on the Delaware River Master’s Advisory Committee, and a state representative for the Association of Clean Water Administrators. He has a B.S. in Chemical Engineering from Clarkson University. Dr. Howard Zucker is commissioner for the New York State Department of Health (NYSDOH). In his previous role as first deputy commissioner, Zucker led DOH’s disaster and emergency preparedness and response initiatives. He worked closely with the New York City Department of Health and Mental Hygiene and other health-related entities in the city. Before joining DOH, Zucker was a professor of Clinical Anesthesiology at Albert Einstein College of Medicine of Yeshiva University and a pediatric cardiac anesthesiologist at Montefiore Medical Center in the Bronx. He earned his M.D. from George Washington University School of Medicine. Dr. Roger Sokol is the director of the NYSDOH’s Bureau of Water Supply Protection and is responsible for regulatory oversight of more than 10,000 public water supplies. Previously, he was chief of the New York City Watershed Section, where he oversaw the largest water system in the state. In 2004, the NYSDOH presented Sokol with its prestigious Commissioner Recognition Award. The author of numerous papers in the field of aquatic ecology, Sokol received his Ph.D. from the University at Albany, State University of New York (SUNY). Richard Lyons has worked for the Albany County Sewer District for over 40 years. In June 2015, he retired as executive director and now works part-time as a project manager. Lyons also serves on the county Energy Advisory Group and as president of the Local Development Corporation, which governs the implementation of the Albany Pool Combined Sewer Overflow Long Term Control Plan. He was president of the New York Water Environment Association (NYWEA) in 2012. Lyons has received numerous awards from NYWEA and the American Public Works Association and received the Water Environment Federation’s Arthur Sidney Bedell Award in 1998.